One of the distinguishing features of the skipper Atalopedes campestris is that "the female has a glassy spot just beyond a black patch in the DFW cell" (quoting from page 82 of The Butterflies of Cascadia). What you see here both is and is not (!) a picture of that glassy spot. Why the ambiguity? 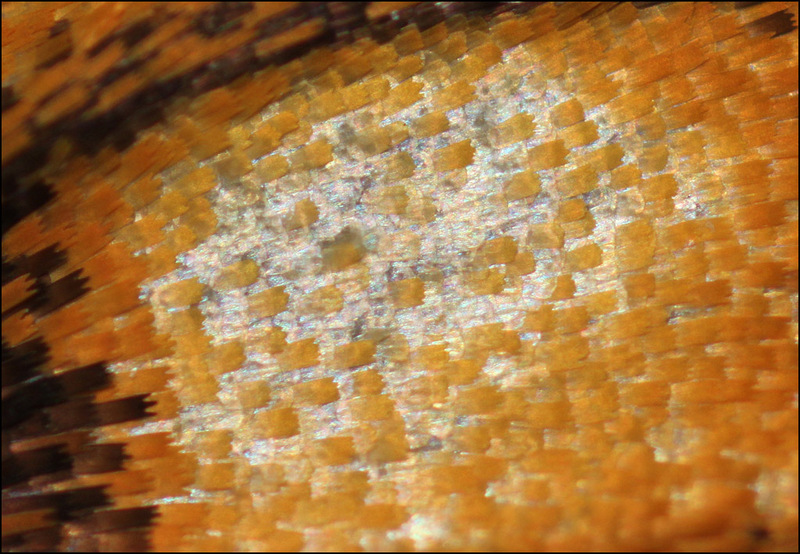 Well, it is a picture of the glassy spot, but this is actually the ventral front wing, not the dorsal. I thought it would be fun to show the structure of the spot, whatever that turned out to be. When I looked at it under a dissecting scope, the ventral side seemed much more interesting than the dorsal. On dorsal, the glassy spot seemed to be populated with normal scales, just more sparse than usual. In contrast, here on ventral there are gobs of scales in the spot, maybe even more than elsewhere, but they have this unusual structure of being short, translucent, and many of them are tipped up on end. I had a lot of trouble figuring out how to show this structure. The usual perpendicular view didn't do the job. 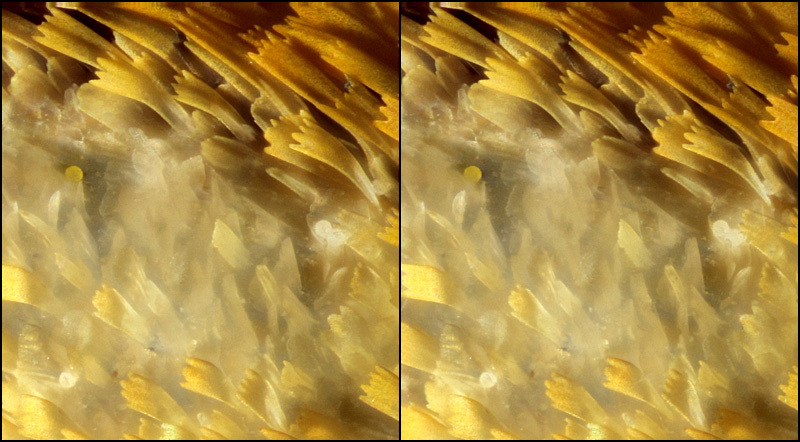 Even with high magnification stereo, the tipped-up aspect was difficult to see. Finally I decided to try the angle you see here, roughly 45 degrees to the surface. That seemed to work OK. Lighting is with dual fiber optic, one head undiffused and glancing from the left, the other head from the right, diffused and less glancing. After finally getting the layout to work, I had planned to do one last dusting to blow off stray scales and then to shoot another series at a little higher magnification and finer focus step. 38 mm f/2.8 Olympus bellows macro lens at f/2.8, 0.0015" focus step, Zerene Stacker PMax. p.s. The images and explanation are also interesting. Can you take a low magnification image that shows the glassy look? Sorry, there won't be time. The box containing a Canon T1i is supposed to arrive Tuesday. HD video and electronic first shutter curtain were compelling, especially for less than $800 delivered, with a spare battery and 4 GB memory card. I'll be happy to shoot the spot as an early test. The new camera arrived last week, but it took me a while to read the manual and then to figure out how it actually works. For a while, Live View was giving me a black screen unless I set the exposure time so long that captured images were then pure white -- about 32X overexposed. Contrast this with the happy one-liner in the manual: "The Live View image will closely reflect the brightness level of the actual image you capture." I'm still trying to nail down how everything interacts, but right now it seems that M mode (fully manual) plus bellows does not always play nicely with Live View. Anyway, it seems to work fine once the appropriate buttons have been pushed. I've just barely started to explore new capabilities. But here are a couple of "first result" pictures that I thought were pretty interesting. These are again the underside of the glassy spot, first with undiffused illumination from the left as before, then with slightly diffused illumination from the right to pop some reflections off the surfaces of what turn out to be very transparent scales. These images are stacked from HD video movies (1920x1080, 20 fps). Each movie is 18-20 seconds long and was shot with continuous movement of my milling table over a total span of about 0.030" = 760 microns, or about 2 microns per frame. This is not grossly oversampled, given that the optics are a 20X NA 0.40 microscope objective. Microscopyu calculates a DOF of 5 microns for this lens, and indeed the movies show significant change in appearance between frames, particularly for the specular reflections. I used QuickTime Pro to export each .mov file to a sequence of several hundred image files, and stacked those using Zerene Stacker to make these synthetic stereo pairs (+-5.5% shift). To get a good feel of the transparency, consider the two pollen grains hiding behind the transparent scale at center right. 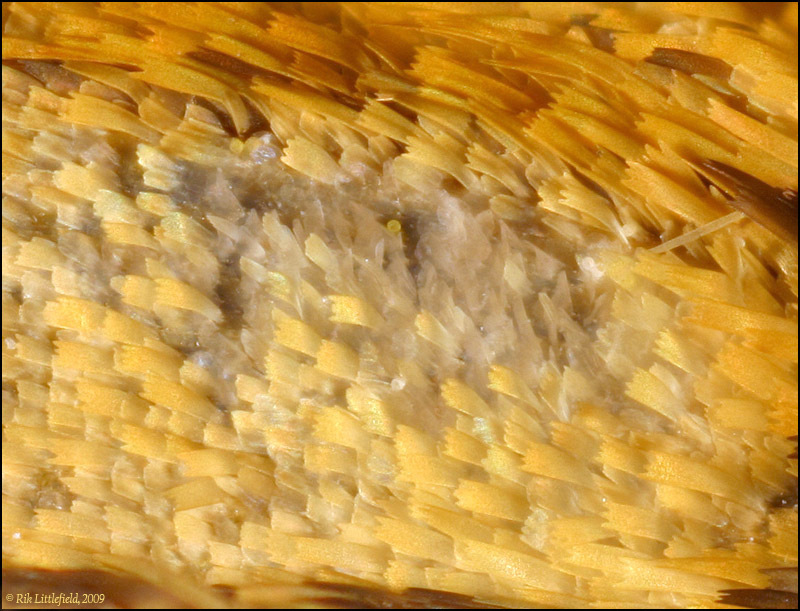 Or take a look at upper left, where the transparent scales sit in front of ordinary orange scales. Is the Proxxon motorized or are the years of gramphone practice playing Caruso on 78s coming in handy? And that's about 2 Mpixels, at first glance, but is that a correct assumption? Does the movie mode use the whole frame, 6 pixels to 1 or ...? Movie mode uses the full width, but crops off a narrow strip at top and bottom to get the right aspect ratio. I don't know what interpolation they're doing. Native high res images are 4752 pixels wide, which would be exactly 2.475 times 1920. Subsampling 1:2.475 at over 41 megapixels per second seems challenging, so I presume they're taking some shortcuts. There's also a compression issue, since 1920x1080x20 x 3 bytes RGB would be over 124 MB/second, but these actual files are only 4.8 MB/second. QuickTime Player reports that the compression is H.264, but I don't know which variant. In any case, it's clear that images extracted from HD video cannot in general be as good as still images captured at the same resolution. On the other hand, they're good enough for my purposes here, and I sure feel a lot better about recording 18 seconds of video than I do about using up 360 cycles of my mirror and shutter. Some new pictures here, mainly because ages ago augusthouse asked me to take some pictures of the glassy spot, and I'm not sure the earlier pictures have done it justice. Let's start with the animations. 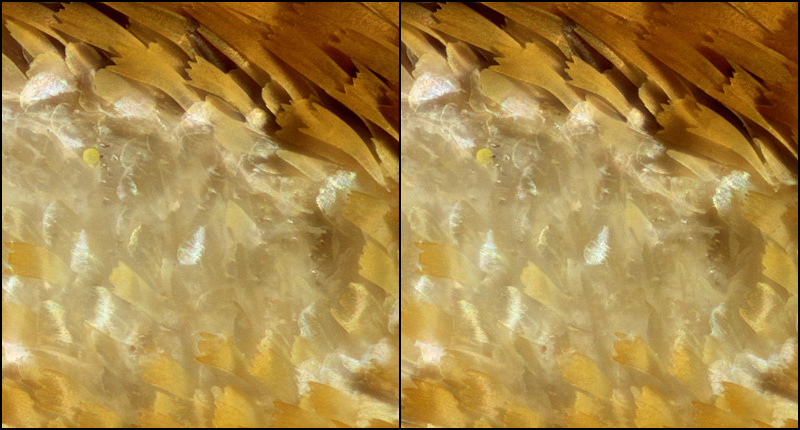 These are with diffuse illumination from the front, with and without extra light on the background. I've done some level adjustment of the front-lighting-only frames, to sort of match their overall appearance so that you can watch the glassy spot do its thing. In the first image, the glassy spot is dead center, just to the right of the dark area. We're just zooming in closer and closer here. Now here is a shot with front lighting only, but carefully positioned to catch a specular reflection off the glassy spot. It should be clear that the appearance of this spot changes a lot depending on how the light hits it. If I had to give a short description, I'd say it's a lot like waxed paper -- sort of translucent, but also shiny if you catch it in just the right light. All of these except the first were shot with an Olympus 38 mm f/2.8 bellows macro lens, wide open. Live View on the T1i, zoomed in, makes it trivial to get precise focus even with vanishingly shallow DOF. That plus the electronic first shutter curtain to eliminate vibration is a killer combination for bench work. The last two animations and the specular reflection off the glassy spot are quite revealing.